This screenshot from a webcast shows SpaceX's Falcon 9 rocket blasting off on April 27, 2015, carrying the first-ever satellite for the Central Asian nation of Turkmenistan. The private spaceflight company SpaceX launched the first-ever satellite for Turkmenistan into orbit Monday evening (April 27), marking the second space mission in less than two weeks for the firm's Falcon 9 rocket. 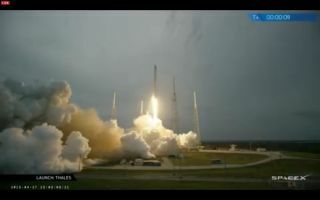 The SpaceX Falcon 9 rocket blasted off from Florida's Cape Canaveral Air Force Station at 7:03 p.m. EDT (2303 GMT) to deliver the TurkmenÄlem52E/MonacoSat communications satellite into orbit, after a 49-minute delay caused by cloudy conditions. The satellite, which was built by France-based aerospace firm Thales Alenia Space, weighs about 9,920 lbs. (4,500 kilograms) and has a design lifetime of 15 years, according to a mission description. The spacecraft will be operated by the Turkmenistan Ministry of Communications and has a coverage area that includes Europe, Central Asia and Africa. "Once operational in orbit, TurkmenÄlem52E/MonacoSAT will allow Turkmenistan to operate its first national satellite telecommunications system, ensuring enhanced, secure telecommunications for the country," SpaceX representatives wrote in a mission fact sheet. An artist's illustration depicts the TurkmenAlem52E/MonacoSAT, that will allow Turkmenistan to operate its first national satellite telecommunications system. The successful Falcon 9 rocket launch marked SpaceX's fifth mission of 2015, and the second in less than two weeks. On April 14, a Falcon 9 rocket launched a SpaceX robotic Dragon capsule toward the International Space Station on a cargo mission for NASA. That April 14 launch also featured a rocket-reusability test, in which the Falcon 9's first stage attempted to land on an unmanned "spaceport drone ship" in the Atlantic Ocean. The rocket stage managed to hit the boat but toppled over on the deck and exploded. The landing attempt failed because of an issue with the stage's throttle valve, Musk has said. The landing maneuvers are part of SpaceX's internal effort to develop fully and rapidly reusable rockets, a breakthrough that Musk has said would dramatically cut the cost of spaceflight.